With embroidered motifs representative of Indian textiles, this exceptional piece enrobes the bed in handcrafted sophistication. 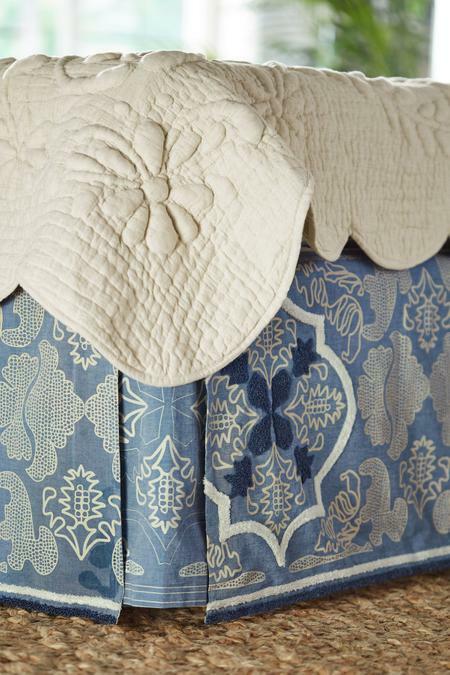 Intricate needlework in ivory and deep blue scatters across a swathe of sky blue chambray cotton. The corners are punctuated with chambray kick pleats for a streamlined 17-inch drop and the lining and deck are fabricated of cotton. A refined accessory to complement many of our luxurious bedding collections. 100% cotton, with rayon embroidery. Twin: 75"L x 39"W x 17" drop. Queen: 80"L x 60"W x 17" drop. King: 80"L x 78"W x 17" drop. Kick Pleat: 10"W for all sizes. Machine Wash Cold, Gentle Cycle, Only Non-chlorine Bleach When Needed,tumble Dry Low, Do Not Dry Clean.